Hello my dear friends! Roman is here with you as usual. Today I’d like to make a video answer to user with nickname Ali Kazemi Lari . 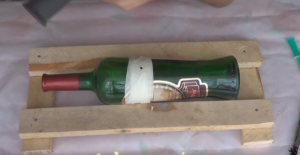 There were two questions – one was how to make a hole in a glass bottle, and the second one was how to cut a glass bottle along. I’ll answer the second question a bit later as I’m making experiments and searching for the most convenient way to do this. I’m not going to use a standard way of using a small engraver heading, and cutting it with a cutting disk like a little disk grinder. Let’s start answering the first question. Here is a wine bottle. I’ve made such a stand with plain wooden rails beforehand. It will help to avoid moving of bottle while drilling a hole. If you can’t make such a stand, you may dig a pit in the ground, put two bricks or two cattles, it depends on your imagination. 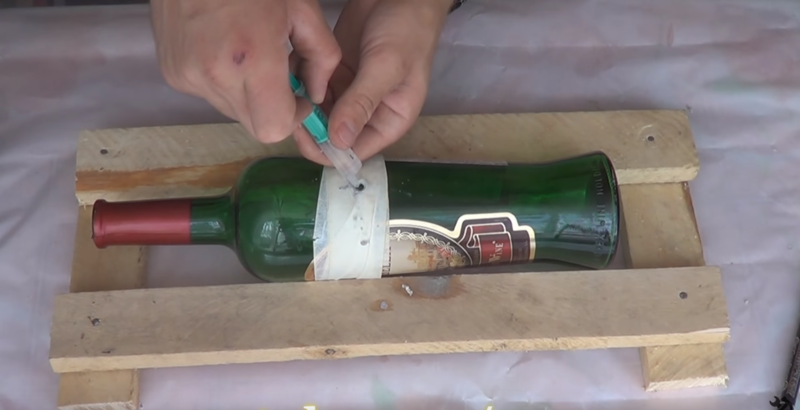 First thing we have to do is to wrap a paper scotch around the bottle near the place of a hole. 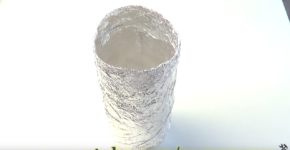 For example, we’ll wrap it here. Then, put the mark on the place of drilling. 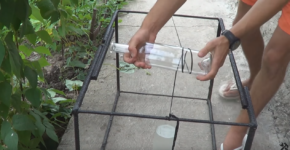 We are going to use a simple drill, of course, it’s better to use a screwdriver, as it it has a low speed of spinning, and we don’t need hight speed of spinning for drilling the glass. The drill is simple, without tungsten-carbide dust. It is good to use a tungsten-carbide feather. If you haven’t got it, you can use a simple drill, and don’t listen to those who convince you that it’s compulsory to use tungsten-carbide drill, and the simple drill won’t do. Today I’ll prove them wrong. This is the drill of 8,2 mm, steel P6M5. Let’s start. It’s important not to press the drill to much, because glass can crack, and we’ll fail to work it out. So let me show you what we got. 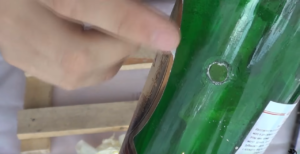 As you may see, the glass began to drill. 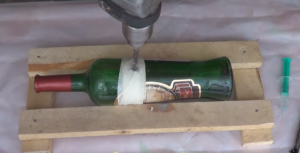 The important thing is also to add some water into the hole, not to overheat the drill and a glass bottle. Well, we have made a hole. Let’s remove scotch, and see what we got there. We have got such a hole. If you look closer, you’ll notice small cracks inside, it is caused by overpressing the drill in the end. If you control the pressing of the drill, especially in the end of drilling, when the hole is almost made, you’ll get an ideal hole. So you might see that we did it well without using tungsten-carbide or special appliances. Thanks for your attention. Subscribe to the channel. Bye-bye everyone! How to cut a bottle in two with a shoe-lace without fire!